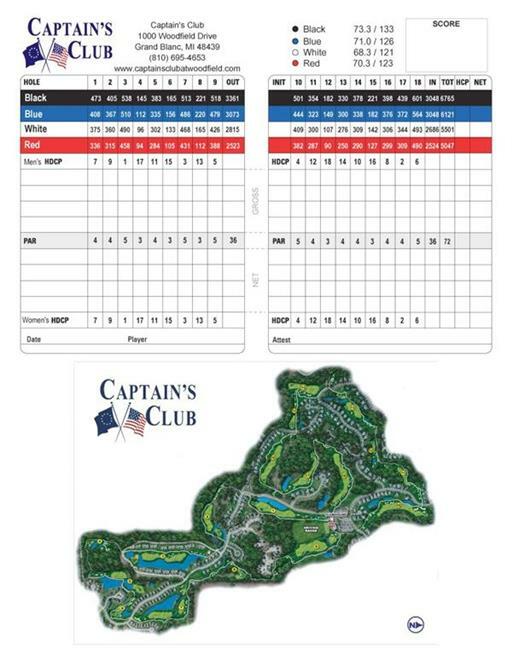 Captains Club at Woodfield is a public golf course located in Grand Blanc, Michigan. The course originally opened in 1993, it features bentgrass greens and fairways. The course consists of five Par 3's, eight Par 4's and five Par 5's and plays to a maximum distance of 6765 yards with a course rating of 73.2 and a slope of 135 over 18 holes. Four sets of men's tees and a single set of ladies' tees create an enjoyable test of golf for players of all abilities.